Man Arden 7X Activated Charcoal Face Wash is a unique and pioneer formula in its segment that offers brightened skin tone, removes impurities, gives a refreshing feel and exfoliates your skin for visibly clearer complexion. Made with most efficacious natural extracts, oils, and other skin benefitting ingredients, such as, Tea Tree Oil, Vitamin B5, Oat Meal, Lemon Peel, and Roman chamomile Oil to give your face a natural healthy feeling. Explore the entire range of Face Wash available on Nykaa. 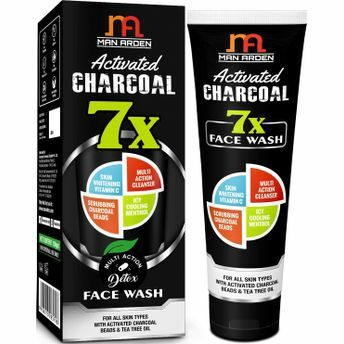 Shop more Man Arden products here.You can browse through the complete world of Man Arden Face Wash .